The growth forecast for digital music revenues is all the more reason to ensure we get the business model for online music services right – that is, we ensure that it harnesses the possibilities of the open Internet for easier sharing and more creativity. Though labels are fighting a rearguard action that focuses on an “Internet users versus artists” frame, what we’ve found in the “Our Digital Future” process is that Internet users are very invested in respecting creators. In fact, Internet users who participated in our crowdsourcing process would very much like to see creators get a greater share of the revenue generated by their work. Overall, 92.5 percent of respondents to a question about how much digital music revenue should go to the artist, believe that at least 50 percent of the revenue should go directly to the artist; 67 percent wanted to see more than three-quarters of the revenue go directly to the artist. The “Our Digital Future” process provides evidence that Internet users believe in a business and revenue model where artists and content creators are fairly compensated. We also see new possibilities for creators to benefit in the digital environment, and insist that copyright law should protect those possibilities. According to research done by Rolling Stone magazine, distribution through CDs or the iTunes store should both result in about the same royalties to the artist – a typical record contract gives the artist approximately 16 percent of sales.12 However, in the offline market, labels have been cutting into artist’s royalties for years, “with deductions marked ‘free goods’ (usually 10 percent of the artist’s royalty) and ‘packaging’ (usually 25 percent)” dropping the royalty down to about 11 percent.13 These deductions don’t apply to digital sales – so there is reason to believe that in the iTunes store an artist inches closer to the revenue-split ratio our crowdsourcing participants would like to see. Though in this scenario, the label still takes the majority of the revenue: out of the $1.29 paid for a song, “a grand total of 60 cents goes to Sony to pay for marketing, publicity, videos, executive salaries and obviously, profit.”14 And this is all assuming that the artist has paid off their debt to the record label for expenses like videos, tour support, etc. 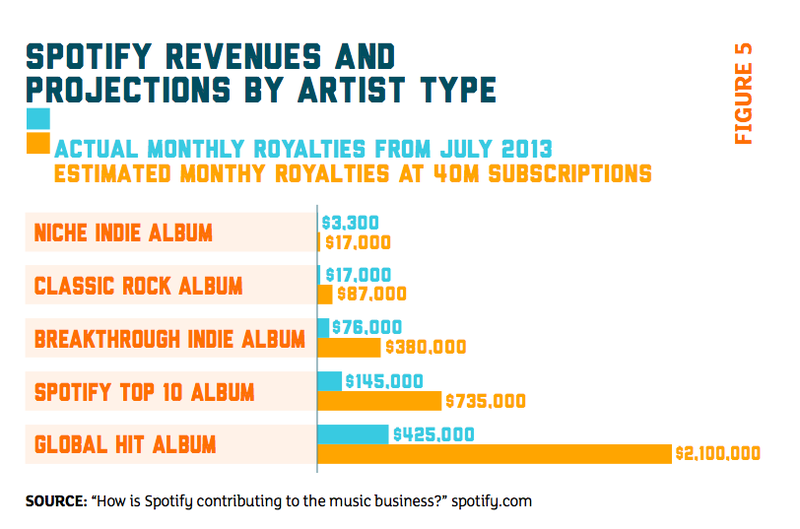 By contrast, though there are very legitimate concerns about the small amount of royalties per play15 on a streaming service like Spotify, the amount of royalties paid to the artist relative to the label looks closer to what our crowdsourcing participants wanted (Figure 4). And as the plays accumulate so does the revenue to the artist. Spotify also aims to grow the amount it gives to both niche and breakthrough indie bands, creating new sources of revenue for artists that may have had a hard time competing in the pre-digital era (Figure 5). This is not to claim that the current digital era is perfect – direct distribution to fans and crowdfunding are much easier for celebrity artists with name recognition value, while emerging artists still struggle. As Nicolas Suzor and Dan Hunter point out, “Since the 1990s the copyright system has been made more and more onerous – but most artists haven’t been getting any richer.”25 In Australia, for example, the majority of people who identify as professional artists make less than A$10,000 per year from their primary creative activity.26 Alternative proposals like a Creative Contribution,27 or a basic income,28 are worthy of serious consideration to overcome the challenge of financial security for artists – a challenge that long precedes the digital age. The important thing to keep in mind when considering the online era is that we don’t know what the business models of the future will look like: as Amanda Palmer says “The truth is there is no next model. Show me 1,000 talented musicians, each with a unique style and personality, and I’ll show you 1,000 ways to make a career in music... there is no longer an off-the-shelf solution.”29 The uncertainty surrounding future business models, and the possibilities of the open Internet to bring the creative industries closer to what our crowdsourcing participants wanted (i.e. a majority of revenue going to artists) lead us to draw two conclusions with regards to copyright and free expression: that real protection for safe harbours is needed, and that “three-strikes” style copyright policy will be harmful to creators. “Safe harbours” are online service providers, such as YouTube, which under the US Communications Decency Act’s (CDA) Section 23030 are exempt from liability for copyright infringements by third parties who use their services. They are often used by emerging artists that don’t yet have access to distribution channels like television and radio – safe harbours provide the artist with a way of reaching audiences that would have been impossible in the pre-digital era. Protections for safe harbours like those outlined in CDA Section 230 are therefore crucial. Current copyright regimes, however, compromise these safe harbours by permitting dragnet-style takedowns of content, which often sweep up legitimate uses and reuses of content by artists, and disable their access to crucial audiences, as we will explore further in the next section. Given the results of the “Our Digital Future” project, we support London-based human rights organization Article 19’s Principle 8 on free expression and copyright in a digital age: “Disconnection from access to the Internet on grounds of copyright is always a disproportionate restriction on the right to freedom of expression.”32 In countries like France where three strikes policy has been tried, it has ultimately been seen as overly expensive, bureaucratic, and ineffective, and has been abandoned in favour of relatively small fines instead.33 Unfortunately, however, leaked drafts of the TPP suggest that the chapter on intellectual property would seek to impose three-strikes rules on the 12 countries currently negotiating the agreement.34 Because three-strikes rules are just as likely to target creators as they are to target regular Internet users, and remove them from what is increasingly a crucial means of making a living as an emerging artist, these rules should be rejected in favour of civil liability that focuses on compensating creators (see the section “Respect for Creators 3” in this chapter for further discussion of this issue). Prioritize Compensation for Creators” in this chapter for further results from this question. Put this citizen-powered report into action — email it to your decision makers! Fill out this form and we’ll send it for you.